Home / "Approve in Russia a quick, right, merciful and equal court for all ..."
On the title page: The Presidential Library presents "Approve in Russia a fast, right, gracious and equal court for all ...": 1864. To the 150th anniversary of the judicial reform. Duration: 13 minutes 16 seconds. 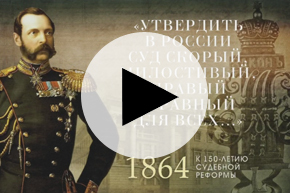 The film narrates about the exhibition devoted to the main stages of the history of legal proceedings in Russia and the preparation of the judicial reform of 1864. In the original and digitized form, documents, laws, studies, first judicial statutes, memoirs of contemporaries and other materials . I. Evseeva, Marina Igorevna. II. Pazovnikova, Elena Vladimirovna. III. Soloviev, Denis Valerievich (Candidate of Historical Sciences). IV. Raytsev, Nikolai Yakovlevich. V. Kuzmin, Roman. VI. Lermontov, Elena Nikolaevna. VII. "Approve in Russia a fast, fair, merciful and equal for all ...", an exhibition (St. Petersburg, 2014-2015). VIII. Presidential Library. B. N. Yeltsin (St. Petersburg) .1. Presidential Library. Boris N. Yeltsin (St. Petersburg, city) - Events - Multimedia publications. 2. "Approve in Russia a fast, fair, merciful and equal for all ..." exhibition (St. Petersburg, city, 2014-2015) - Multimedia publications. 3. Power (collection). 4. Judicial reform of 1864 (collection). 5. Judicial proceedings - Russia - Multimedia publications. 6. Judicial reform - Russia - 1864 - Multimedia publications. 7. Video tours.